Are you an organic kinda gal? If so, you’ll be particularly interested to hear about Cargo’s new Plant Love Collection which will be available in the UK exclusively from organic beauty boutique Puresha from the 30th September onwards. Plant Love is the first Ecocert™ premium makeup line to be launched in the UK, and Puresha are (understandably) rather excited about it! 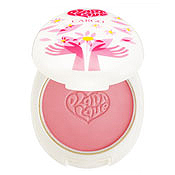 PlantLove™ combines earth-friendly formulations and packaging with CARGO’s dedication to creating professional-grade make-up, for a line of cosmetics that represents true beauty with conscience. One brand, with so many benefits. The entire PlantLove™ Collection is natural in origin. PlantLove™is free of parabens, phthalates, petro-chemicals, synthetic dyes and fragrances. The cosmetics are only manufactured in countries with solid environmental and product labour records. This means that PlantLove™ is entirely in harmony with the Earth. The lippies hold particular interest for me, 11 of the available 20 shades have been celebrity-designed. “Celebrity-designed” products usually make for popular choices, so I’ll be very interested to hear how these fare. I’ve scoured the net for some images to get more of a feel for the collection, and would like to share what I’ve found with you! How cute does this look? I’m a total sucker for baked products and this looks like it might flatter my pale skin-tone really nicely without just being a highlight product. Pretty! This is Cargo’s Plant Love blush in Peony. 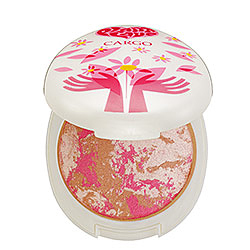 I’m fairly new to Cargo products in general, but am already a fan of their blush formula which is finely-milled and long lasting. I hope these live up to their parent company’s existing line! 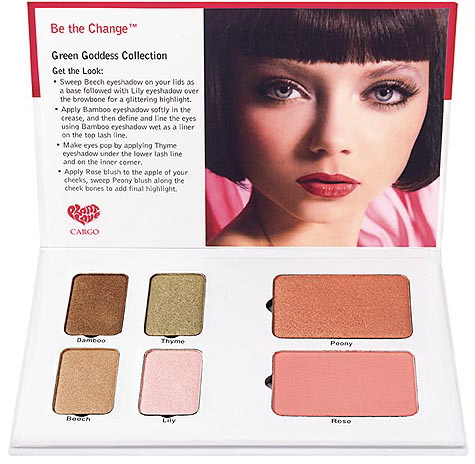 The last product I’ll show you is the Green Goddess Collection, I love the convenience of palettes, but they often disappoint by usually containing 1 or 2 bogey shades! This one certainly doesn’t seem to be suffering from that problem with a selection of lovely, easy-to-wear shades. Hand on heart, I can’t say that I get particularly excited by the word ‘organic’, if anything I’m usually a little sceptical as to whether the products may sacrifice quality in return for their ECO-credentials but CARGO Cosmetics are a well-respected Canadian brand that have already achieved a good reputation for quality cosmetics. Not only that, but the more I’ve read about and dribbled over the images of the products in the collection – the more hopeful I’ve become that these won’t disappoint. I’m already in love with the cute retro yet modern packaging – which incidentally is made from a special plastic manufactured entirely from plant materials (not petroleum). Now, that’s what you call innovation! The packaging looks gorgeous and I’m lemming the green goddess palette as I can see me wearing the shades. I need to get my hands on the palette! Its gorgeous!!! I love the packaging..its a bit childish but it hits my make-up craving!! I’m not entirely sure I get what the big deal about “celebrity designed” beauty products is … I mean, you wouldn’t buy anything else just because it was designed by someone famous for singing/acting/looking pretty, would you? Call me old-fashioned, but I like my cosmetics designed by people who KNOW cosmetics. @Rhamnousia How dare you, I’ll have you know I’m sat here in 4ct diamond earrings and not much else. @Tali Pretty isn’t it?! How shallow are we? In all seriousness though, I think that any celebrity designed product is usually aimed at people who generally don’t know much about the products they’re buying. Perfumes in particular. It’s much easier for Aunty Amy to buy darling Ava the latest Britney Spears fragrance for Christmas knowing that Ava is a huge fan, than it is taking the time to find out what scents genreally make Ava want to vomit. Which is probably why they are so popular… I don’t really have anything against it – and I actually do have SJP Covet – ‘cos I lovvvve her. As for the whole “nature” thing – as I said in my post, I’m wary of products sacrificing quality for eco-credentials.. but in this case, knowing CARGO has quite a good reputation to uphold (especially in Canada) hopefully they wouldn’t take the brand down this route recklessly. Haha, that CAN’T be good for your cold! About schelbs making beauty products, I tend to be a bit of a snob when it comes to them because I just think “what can they know about makeup making?”, they usually use the cheapest ingredients and just sell them because people recognise the celebs face on them. Kinda like advent calenders for kids cartoons, kids recognise the cartoons and the chocolate is usually crappy. I think thow who “know” their products, ie know how a shimmerbrick is different from a bronzer tend to stay away from celeb products. You never see makeup manufacturers rock up on the set of a movie and act in it, do you? ooh, the packaging is drawing me in.